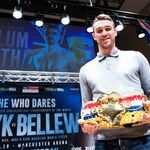 Callum Smith interview - "I'm the best in the division... Liam joining Matchroom was long overdue". Boxing Social's Andi Purewal spoke to WBA 'Super' and Ring Magazine World Champion Callum Smith in Liverpool. Any mention of when/who he's fighting next? As for Liam; he isn't beating any of the current 154lbs champions, can't see where Eddie is going to take him. Fitz v Fowler winner ? How do you see Smith (Callum) vs Plant? I think Smith beats him on points. Bigger, taller with a longer reach. Will keep him at arms length for much of the fight, which probably means Smith would get KO'd inside 3 rounds! Smith overrated, had one victory over a shot groves and thinks he's elite. Very basic fighter that will get found out when he steps up. I thought that mate, then I remembered Brooks supposed to be going back to 147 ... again. I can't see the snake oil seller letting that slip by. One of those lose and off the books/retires jobs? There were rumours of a Smith (Liam) Martin Murray fight circulating last year, so I'm a bit surprised that he's meeting Egg at 154 ..
A guy who just got banjoed in 2 by an unknown African. Hearn ain't even trying anymore. Taking the piss mate. .. Smith vs the African lad would have been better ..
Callum isn't a ticket seller, and will never be PPV, he's worthless to Hearn really. Hearn will use him to feed to Bivol and keep those Russians on side, their stable is elite. Makes me laugh him saying that Liam joining matchroom is long overdue. Liam Smith should forever be grateful to Warren for getting him the easiest world title win & first defence I’ve ever known a British fighter have & then he got him a big pay day against Canelo. He did an unbelievable job for Smith & all down to Frank’s relationship with the WBO which Matchroom don’t have. Seemed as good a place to post this as any.